It’s a pain to do. Despite looking like an awesome chemistry set on the stove (which happens to make coffee), it takes a fair amount of setup, cleaning, etc. You have to make a lot of coffee. Single servings are my preference; I can’t go through a pot a day. So I had already migrated to the whole “pod” experience. My previous pod coffee maker was a cheap contraption that I probably picked up on Woot sometime in the past. It has a bit of a limited set of features, but it does work and pushes steam/water through a standard sized coffee pod. Beyond that, I wasn’t looking for much. Then I got this Brewbot. After making a few cups with it, I’ll probably use it more often. But let’s dive into the details. It’s a pod-based hot drink maker. For those not in the know, “pod” coffee is a single serving of coffee grounds which makes just one cup of joe and then can be disposed of. You usually buy the pods in 12 packs or so, make your cups when you want, and then go buy more because, face facts, you’re a caffeine addict. The Brewbot is basically the same thing, but it is unique in two respects. First, instead of using the standard pods, it uses “T-Discs“. Normal coffee pods are usually just coffee packaged into a paper covering which is similar to the type of filtering paper you use for normal drip coffee makers. Like a little floppy disc of coffee. T-Discs, however, are these hard plastic shells that surround your coffee grounds. They have an aluminum foil type of seal on the top. When you insert them into the machine and close it, the seal is broken and a hole is punched into which hot water is injected. Your drink comes out the other side. Second, T-Discs are not necessarily coffee. They have a whole range of hot drinks, from your basic coffee, to various flavors of coffees (cappuccino, latte, espresso, crema), to hot chocolate, as well as assorted teas. The disc itself has a tiny barcode on the top, and the machine has a barcode reader inside of it. The barcode itself tells the machine how to pour the water through the disc (timing, temperature, stuff of that nature, presumably). However, that’s about the only unique thing with the machine. And it’s not that unique, even my cheap pod coffee maker has three ways of pouring water, using three different pod holders (each of which makes the machine pour differing amounts of water). Heck, my cheapo one even has a milk frothing wand on the side. Okay, it’s not as easy to use, I grant you. Ease of use is important, and this thing absolutely cannot get any easier to use. 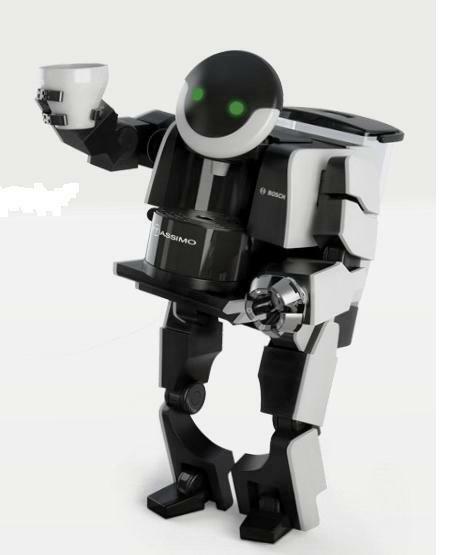 Also, unlike some of their advertising implies, it doesn’t turn into a robot and bring you your coffee. In this respect, their advertising is somewhat disappointing. I mean, come on! We live in an age where we have robots cleaning our floors, when the heck will I get my robot butlers and flying cars!? You absolutely cannot make the process any simpler than this. Seriously. Okay, so occasionally, you have to refill the tank on the back with water. Even more occasionally, you may need to clean the thing out. And some drinks take more than one disc. But still, it’s as simple as it gets. Oh, they also sent me a red color kit too. Seems kind of pointless to me, but hey, I guess you can customize it up in this way if you like. Also handy if your cup platform insert breaks. The insert is removable to allow you to put large cups into the unit, such as for lattes. It’s also re-positionable upwards a notch, for using small espresso sized cups. The first setup is fairly straightforward. You fill the unit with water, insert the special cleaning disc, then let it pour a cup of water through it five times. The cleaning disc itself fits into a nice compartment for it on the back of the unit, and it is basically just a plastic disc with a hole in it and a barcode on it. All it really does is to tell the unit to pour some water through the thing. The manual says to use it when you need to run water through it to clean it out, or to remove lime scale buildup from the water using special cleaning fluid you can find for the job. It does specifically state not to use vinegar, which is a common way of cleaning lime build up in some other machines. I can understand why, you’d probably have to flush a lot of water through afterward if you didn’t want vinegar flavored coffee. 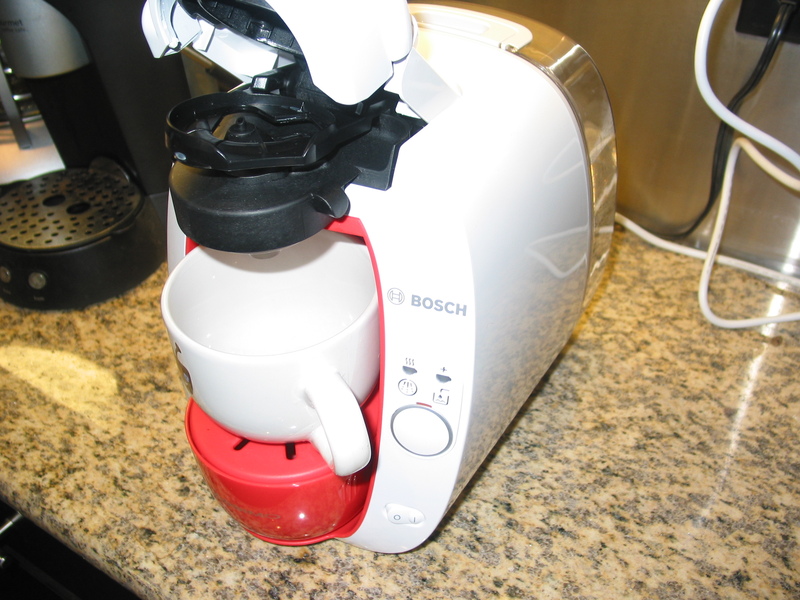 The unit they sent me was the Bosch Tassimo T20. It’s the lower end model. The more expensive models have a few extra features like LCD displays, water filtering, chrome, and so forth. They also sent along two types of drinks: Gevalia Coffee, and Starbucks Cappuccino. The Gevalia Coffee is straightforward. Insert disc, receive coffee. Quality-wise, I’d rate it as good as any other Gevalia coffee. It’s decent and drinkable. Nothing particularly special to say about it. One handy feature of the machine is that after the initial brewing is done, you can hold the single (and only) button on the machine to force it to pour through more water, allowing you to adjust the amount and strength of your coffee. In practice, what this means is that the initial brew comes out somewhat stronger than you’d expect. Adding a bit more water to lighten it up works well. However, the initial pour is large at a full 8 oz., so you may need a larger cup than your average small coffee mug if you do this. The Starbucks Cappuccino is an interesting one, because it comes in two separate units. The first disc is a cream disc, which is noticeably larger than the coffee units, and full of liquid instead of grounds. You insert this into the machine first, and it pours out a frothy milky concoction. After that has finished, you insert the espresso disc, press the button again, and it pours a shot of espresso into the glass. The espresso is very strong and mixes well with the cream, giving you a decent cappuccino. Especially when you consider that start to finish takes only a minute or two. As with the coffee (or any other drink), you can hold down the button after each step to force a larger pour. I tried this with the espresso, but it just watered down the cappuccino, and made it weak. The default amount worked quite well. Comparing this machine to the other two pod machines I have experience with (my no-brand one and the Senseo I gave to my parents for Xmas one year), this one is probably my favorite. However, it has some definite disadvantages as well. It is very quiet. My off-brand one makes one hell of a racket, because of the cheap crappy pump in it. My parents Senseo is fairly quiet as well, but the Tassimo seems quieter. The tank holds about 7-8 servings. Both my cheapo and the Senseo unit only hold around 4. This is a bigger deal than it seems, filling up the tank is annoying when you need your coffee fix. The coffee tastes better. Because of the sealed plastic construction of the T-Discs, no air gets to the grounds. So they don’t really ever go bad. This translates to fresher, highly quality drinks. Both mine and the Senseo use the paper based pods, which do tend to go non-fresh after a while. It’s smaller than it looks. It takes about the same footprint as a normal coffee maker. I do wish it had a undershelf mount, but the need for a water tank sort of rules that out. Barcodes. Though clever, a couple of times when I made the cappuccinos (including in that video above), the barcode reader couldn’t read the milk disc’s barcode. Removing the pod, flattening out the barcode with my thumb, and reinserting it worked fine. So it’s a tad sensitive about that. Cost of unit. The price for the unit ($129 for the one I have) seems a tad on the steep side. It’s really neat, but it’s not that neat. Considering I got my cheapo pod maker for like $20 at one time, and a Senseo can be had for $50, then I think they need to come down a slight amount to be worth it. $80-90 would be more reasonable for the low-end unit. Note: You can get it for $104.99 here: http://bit.ly/Tassimo25 and it comes with two free packs of coffee. Cost of coffee. This is a big one. Looking around on Amazon, I see that I can get relatively decent coffee for my old machines for around 30 cents a pod for basic coffee to 60 cents a pod for the branded stuff. The generic T-discs can be found as low as 45 cents, while the branded ones are at around 90 cents a disc. 30-60 to 45-90 is a bit of a hefty upgrade in price. A full 90 cents for a quality cup of coffee seems a bit high. On the other hand, the coffee is almost as good as you’ll find in a coffee shop, and definitely cheaper than a coffee shop. The discs are made of plastic. Maybe it’s me, but it seems a tad non-green to be making these things for one-use and then tossing them. If they are that type of easily biodegradable plastic, then I have no real problem with it. Perhaps they should advertise that more. It’s a cool unit, and the ability to buy discs that can make hot chocolate or crema or even chai tea is really cool and clever. The use of barcodes is a neat techie thing, although slightly problematic in practice. The cost of the discs is very high, though this will probably come down as more manufacturers make the units. And anyway, the cost of the discs doesn’t phase me too much, as I’ll probably use it for the more specialty drinks and quality coffees instead of the everyday get-me-loaded-to-the-gills-on-caffeine variety of coffee that I’m used to. I’ll use the heck out of the thing, for sure. Especially for hot chocolate in the wintertime. I don’t think I’d buy one given the current price of the unit, but if it was only around $80, then I very probably would get one, just for the different types of drinks it can make. And if you haven’t signed up for the giveaway yet, go over there now. FREE COFFEE. I once posted that I don’t accept advertising on my blogs. This is still true. However, I do accept bribes. And free coffee is a damned good way to bribe a techie. 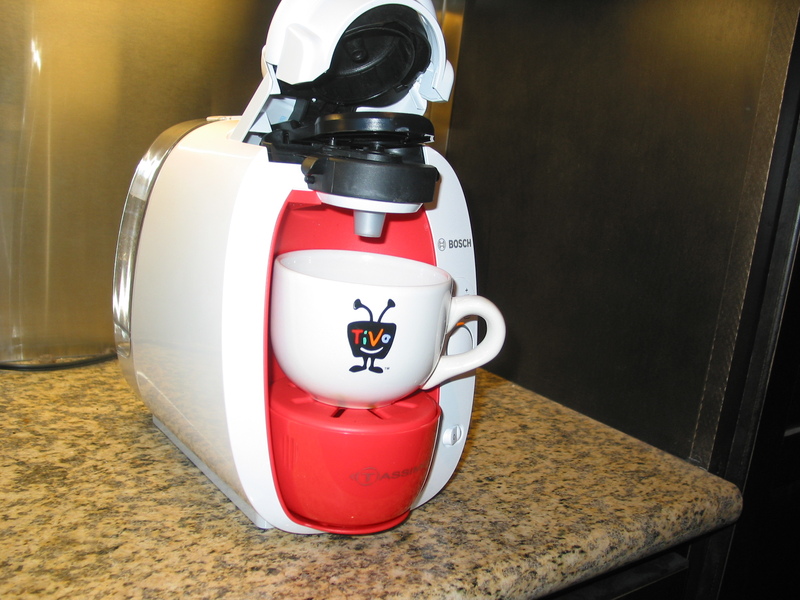 Recently I received a free Brewbot from Tassimo in order to do a review of it. Unfortunately, it doesn’t turn into a robot who brings you your coffee. Color me disappointed. I will have that review up here by this weekend (update: it’s up now), but in the meantime, they also want me to give one away to somebody. Since I have to have the information to them in time to ship before Xmas, I’m doing the giveaway first. So, lucky readers, here’s your chance at free coffee. Leave a comment on this post. One random commenter will be selected on Monday, December 13th. If they respond to emails and give me their mailing address, then they’ll get a free Brewbot. You’ll have to use a real, working, email in your comment for me to be able to email you back and get a mailing address. In the event that the person doesn’t respond within, say, 12 hours, then I’ll pick another person. I can only give away one here, so you have to respond quickly. Multiple entries will be ignored. Don’t bother trying. Also, since Tassimo was kind enough to send me free coffee (who doesn’t love coffee? AMIRITE? ), here’s some links to their various pages. Follow them. And here’s a commercial video that sort of accurately describes the product. If you want to think of it as a single serve pod-based coffee maker, then you’re not far wrong. And read my review on the unit as well. Lame. I took 4 photos and none of them had people in them. I really have to start documenting more. Still, SNOW! I went with my friend Rebecca to The Inn at Hunt Phelan for dinner during Downtown Dining Week. Being a foodie, she took these pictures. Hey, everybody else has a food blog, so I might as well do it from time to time too.